Dust and smiles, ten thousand miles from home. Part Three: Back to school. Great news, everyone - school is in! Thanks to the help of many of you, the village of Ban Houxieng outside of Luang Prabang now has a beautiful, tiny, non-descript one-room schoolhouse of its own. 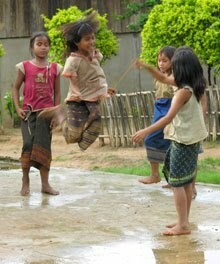 Our dear friend Somnuek celebrated the opening with a gathering of the village and a game of soccer with the kids. Wish we all could've been there. I was lucky enough to get the chance to check out the project's progress this summer when client and dear friend Mary Hobratschk and I made the side trip during a business trip to Bangkok. July is a muggy time of the year to be in Southeast Asia to be sure; every bit as full of the warmth and charm of the people as ever. We flew into a Luang Prabang that's growing by the day - the town has surely doubled in size since my first visit four years ago. Tourism has taken hold; the gem has been discovered. I'm conflicted, I admit. Somnuek couldn't be happier - his gorgeous new guest house Le Bel Air (www.lebelairhotels.com/) is full to the brim and booked for months to come - business is good! The idea of the world discovering this paradise broadens that already huge smile on Somnuek's face. I'm thrilled to see him happy of course, but I'm selfishly nostalgic for the quieter dirt roads of the past; the slower pace of even just a few years ago. The new traffic on fresh (though potholed) pavement creates an entirely different experience. Luang Prabang, for better or worse, is accelerating, rapidly. 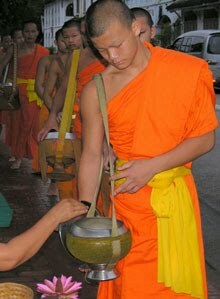 One tradition that thankfully remains is the 5:30 a.m. walk of the monks to receive their daily alms from the townspeople. Mary and I arose before dawn and waited along the monks' route with bowls of sticky rice and earnest respect. Emerging from the dim morning light came a long line of silent boys, shaved heads and brilliant orange robes, each one carrying a covered brass bowl into which we placed a small ball of rice as they passed by - their sustenance for the day. I was excited to see my friend Perb among them - the young monk who'd joined us on our previous journey to Muong Ngoi - and couldn't help but flash a huge smile. I'm sure he was shocked to see me, and it took a moment for him to recognize this white face from his memory, but his eyes lit up when he did, just as he passed by. I was glad to be able to stop by his temple later in the day and say a proper hello. We've swapped a few e-mails since - and if it's not an incredible sign of the times that I'm exchanging e-mails with a Lao monk, I don't know what is. Outside the city limits though, beyond the noise and light, rural Laos seems as serene as it's been for generations. We made our way to Ban Houxieng where the dusty earth had been transformed this rainy season into slick mud; making the trek from Somnuek's van to the clearing for the new school a humorous challenge in our dress shoes. Mary and I were greeted by the village elders and a few dozen children excitedly giggling at the tall white foreigners sliding their way over to the new structure. It's small, and it has none of the amenities of any school you've ever seen, but it's the centerpiece of this village and the locals couldn't be happier. The women presented us with bowls of freshly prepared fruit and the men described what's left to be done - some framing and exterior work mostly. The budget has fallen just short of building desks and chairs and of completing the external toilet; Mary graciously offered to help remedy that situation and I followed suit. Between us we pledged enough to finish the job, and nothing could make us happier for it. The beautiful thing is that as the most solid structure in the village, this simple schoolhouse will stand for generations to come. Who knows how many children will reap its benefits in years ahead - children who might otherwise have never gone to school? Each of you who contributed can take pride in the knowledge that you've changed a few lives here in this distant village. And you're each welcome to visit, by the way - your name's on the doorway after all! I assure that you'll feel every bit of the love that drew me in to begin with - you'll be treated like the family we're all part of. Somnuek officially presents the school to the local district chief on Sept. 27th, 2009. I must say to Somnuek - khawp jai lai lai, my friend! Your hard work and wonderful nature are an inspiration to me. You have a tireless spirit and a warm soul that are a constant reminder to me of what's important in this world. You and your family have taken me and my loved ones in as your own, and I cannot thank you enough for it. I'm glad to have been able to share your beautiful world with my friends and family. And we thank you for the opportunity to share our goodwill with you and your extended village family - we've been enriched for the experience. During our brief 24 hours in Laos, Mary and I visited another remote village (Ban Au) accessible only by canoe - another adventure in clothes entirely unsuitable for mountain trekking (you'd think I'd have learned a few things by now.) 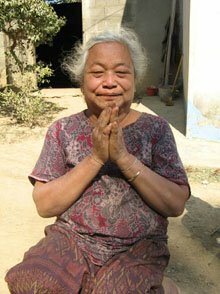 We shared a narrow wooden boat with a fantastic elderly villager, chewing seeds and carrying vegetables in a huge sack by a strap over her forehead, with an odd little laugh - Somnuek later explained that she'd never seen a foreigner in her life. Two young boys pulled us chest-deep up the river just far enough to hop in and furiously paddle us to the other side, where we wandered into a village of a few hundred fascinating souls. Another school project had been started here, but stood incomplete awaiting more supplies. A beautiful quartet of girls played with a makeshift jumprope; they smiled at the odd strangers momentarily but quickly resumed their laughing play. Some boys playing in the river took a different approach, hamming it up for the camera as we passed by - laughing and hugging and diving into the current - absolutely brilliant. The smiles in this country will never cease to amaze me. Never. 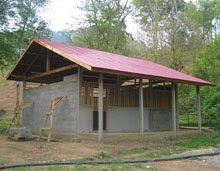 We commited a few more dollars to help this schoolhouse along; again it's the least I feel that I could do. So little goes so far here, and as usual I can't wait to return to do more. But next up is a gift for Somnuek, a chance to repay his kindness. For a man who's helped me realize a few of my dreams, I'd like to help him realize one of his - we're making plans to bring him to the U.S. next summer. Despite some logistical hurdles (Communist governments tend to be reticent about letting their best and brightest wander - therefore he must leave his wife and child at home), we'll figure out a way to show him a little of what life is like on this side of the planet. In the meantime, there's some children right at this moment cursing their homework in a language I still don't understand. And nothing should make us happier. Part Two: Khawp jai lai lai. A white-knuckle speedboat up a mountain river protecting a newborn puppy, a feast on a river bed with a monk, and a serenade from 750 children without homes. For all the types of travel – for adventure, for personal connection, for creating change - never has a trip combined more of these than this most recent southeast trek. And thanks in part to your support, the fruits of our labor may pay dividends for generations to come. A wonderful opportunity was presented to the three of us - me, my fiancee Robin, and her brother Greg - as we arrived in Luang Prabang to meet dear friend Somnuek and his wife and child Sisamone and Mouri. 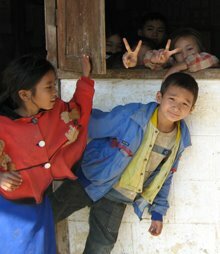 They’d arranged to take their holiday with us up to Sisamone’s home village in northern Laos for a few days. After several hours to road’s end and a death-defying boat ride to the border of Vietnam, we disembarked to the serene riverside village of Muong Ngoi. No electricity here, no roads, no vehicles, just a warm community of locals who took us in as family. About a 20 minute walk down a dirt path outside of this quiet village is a series of caves in the side of a mountain. I was not at all prepared for the story of the cave we found ourselves standing in. Due to Muong Ngoi’s proximity to northern Vietnam, this area endured heavy bombing during what’s referred to here as the American War. And by heavy I mean 24 hours a day, seven days a week, for over ten years. For a decade the entire village moved into these caves while their village and their countryside were decimated. They snuck out at night to reap what they could from their fields, and hid their families and children by day. In a country that has only opened to foreigners in the last few years, in a remote village that has seen very few Americans in the meantime, to be taken in as family by this community speaks volumes about the peaceful and generous nature of these people. We were treated to song and to feasts and to a special ceremony for luck and prosperity offered to few outsiders. They patiently tried to teach us how to fish the local way, and kindly smiled as we bungled every attempt. We visited the small village schoolhouse and the site of a temple destroyed by bombs that they’ve just started rebuilding; small donations to each were accepted graciously. As is so often the case here, I cannot wait to return to do more. To consider that each of the village elders who took part in welcoming us as family, including Sisamone’s father Kumla whose broad smile brightened our visit to no end, spent years in those caves, is beyond moving. 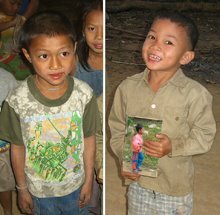 Yet another perspective-changing experience in the life-changing adventure that is Laos. Back outside Luang Prabang we found ourselves immersed in a community of an entirely different sort. Near Somnuek’s home village, where his mother and grandmother and huge family of children welcomed us with broad smiles and ceremonial drinks through meter-long bamboo straws, is a school for children without homes – 750 of them. Most of these children are orphans; some come from villages so remote as to have no schools of their own; they cannot afford transport back and forth so they live and grow up here year-round until they are old enough to somehow make it back. We arrived at a long low structure in mountainous terrain, and to our great surprise were met by all 750 kids in formation singing and clapping to our entrance. Ranging in age from maybe six to sixteen years old, several in bare feet, they greeted us with the huge infectious smiles that so many in this part of the world possess. Their beautiful wide-eyed fix on these tall white foreigners made it obvious that very few outsiders ever see this place. The small staff of teachers unloaded the van of books, pens, mosquito nets and blankets that we had brought, and once we’d collected ourselves from this most moving welcome we were asked if we’d like to address the children. It was all I could do to invite each and every one of them to my humble village in Colorado – though I warned that if they all decide to come at once I’ll need a bigger kitchen. The principal explained that the budget for this school is 2,400 Kip per student per day. That’s 28 cents to feed, house, clothe, teach, and raise 750 children year-round. We were shown the kitchen – a row of concrete fire pits that boil barrels of rice twice a day. We signed a guest book for those who have stopped by and contributed to this school – a book with two signatures in it for the last two years, neither of them from the West. Our small donation was accepted with quiet graciousness, and again I’m overcome with the overwhelming desire to do more. Which leads me to the best news of this latest adventure. You see when it comes to these villages there are different levels of assistance that are needed. At one level there are immediate needs – books, pens, shoes, blankets – items handed to each child that make a difference for a year. At another level there are structural needs – repairing schoolhouses with new roofs, floors, and toilets that create a safer environment for years to come. With your help I’ve been able to offer both types of assistance to several villages, and for that I, and they, could not be more grateful. For the most far-reaching benefit though there can be no greater gift than a school of one’s own to a village that doesn’t have one. As it is with Somnuek’s village, it’s up to each family whether they opt to send their young child on the several-mile journey each day or week to the nearest school, or keep them home instead to help work the fields. Somnuek and I have dreamt of giving a village such as his the opportunity to not have to make that either/or decision – and on this trip, with your help, we’ve been able to start such a project. Over the last year Somnuek drew up the plans, constructed a budget, and secured appropriate approvals from the local government to build just such a school. At our request eighteen of you stepped forward with donations towards this cause, and alongside Robin’s and my contribution we were able to come up with about 90% of the funds needed to make this happen. 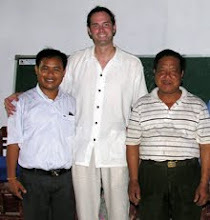 Somnuek has enlisted some family members to oversee the project in the coming months, and his village will supply most of the labor themselves. He’ll update us regularly on its progress, and I’ll in turn update you. If all goes well there will be a new school in place next year, and that’s a benefit to a people for not just years but for generations to come. Thank you for that. Sincerely. Because we are still just a bit short, about $800 at this point, any additional support would be welcome at this or any time. Do share this story with friends, and any additional funds will be sent to Somnuek directly to help finish the job – please contact me anytime. I hope to return next year to see it personally, and of course Somneuk and I encourage each of you to do the same – I guarantee you’ll be treated like family while experiencing a life-changing adventure. Once again, thanks to Somnuek and his family, I have been irrevocably changed by the warmth of the Lao people. Despite a tragic history and having materially so little, the people I’ve met lead rich lives of tight family bonds, warm personal connection, and humble self-reliance; lives to be admired. I always come away with the realization that it is they who in fact have much to offer us as opposed to just the other way around. But that doesn’t keep me from wanting to take part, and if books and shoes and a one-room schoolhouse will bring a smile to those who have treated me so warmly, than I am happy to have a part in it. And so should you be. Thank you for your part, sincerely. Or, as it's said here, khawp jai lai lai. It's an oppressive heat that hangs in the air of the guest house where I first meet the colorful Mr. Somnuek Bounsa. The efficient young man works the front desk where I check in, exhausted and jet-lagged, to this quiet inn on the banks of the Mekong in beautiful Luang Prabang, Laos. I’ve traveled extensively in my life, and Laos (pronounced without the “s”) is objectively one of the most beautiful places on earth. Lush green mountains are a gorgeous backdrop to the lazy serenity of the dusky Mekong river. Monks in bright saffron robes populate brilliant gold-laden temples, which dot the landscape amidst tranquil, earthy villages. But it’s the people of this little corner of the world, their peaceful nature and genuine warmth, that captured me on this first visit – as it is with Somnuek this warm November evening. 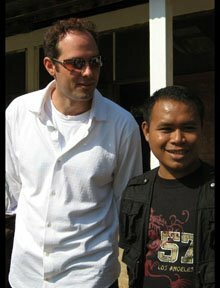 A stout young man with a firm handshake and huge smile, Somnuek committed to learning English as a youth by riding his bicycle across a mountainous landscape every day to a monastery giving lessons. 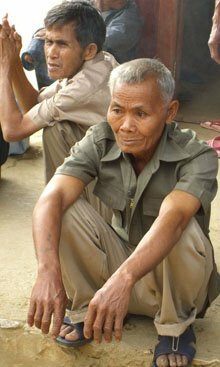 He spends his one day off a week aiding his fellow Lao either through LAO UXO, a local organization aiding bomb and land mine victims, or through his own efforts serving the people of the surrounding hill villages, in one of which he was raised. I'm so moved by his huge heart, infectious personality, and love for the Lao people that we strike a fast friendship as I implore him to describe life on this side of the planet. Laos stands as one of the last remaining Communist regimes among the poorest nations on earth, but political oppression and intrinsic poverty cannot veil a culture rich in history and colorful tradition. Sadly this country is known to the world as the most heavily bombed nation in history, a misfortune of its locale between North and South Vietnam. I discover some staggering statistics – in three years during the war more bombs were dropped here than were dropped worldwide in WWII – that's an unbelievable ½ ton of ordnance per Lao (!). Land mines and unexploded ordnance (known as UXO) still blanket the entire Laos countryside, usually in the form of shiny metal spheres – millions of them - that children find irresistible. Every single day in this part of the world – even now thirty years after the war – another villager, usually a child, meets a horrible death as a result. Every single day. After that first brief stay in Luang Prabang, Somnuek and I continue to correspond all year by e-mail (by working in one of the finest guest houses, he has rare access to an old computer), though our labored efforts at written communication in broken English illustrate the value of gesture and expression that makes our face-to-face communication so effective. 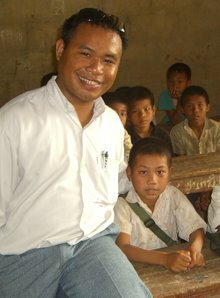 I consider his work with LAO UXO – Somnuek volunteers to travel the region documenting all-too-frequent deaths and injuries from the “bombies” as they’re known locally – and decide to send him a few bucks for a camera to augment the worn leather notebook that he’s been using for the task for years. His gratitude far outshines the small gesture on my part; I start to wonder what more I might do. 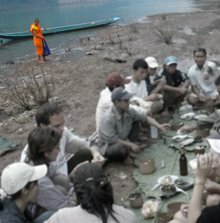 It's a little over a year until I am able to return to Laos with some friends, wanting to explore this culture further. 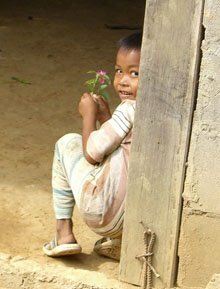 I ask Somnuek for a deeper look into Lao life; he responds by inviting us to visit some local villages including the one he grew up in; I jump at the chance. On his day off he collects us early and suggests we pick up some school supplies for the locals – he says the people are extremely poor and will appreciate the gesture – of course I agree. On our way out of town we stop at a local market and clean them out of notebooks, pens, toothbrushes, toilet paper, shoes, and blankets – all dirt cheap by western standards. Pretty sure we made the market owner’s month. We follow a dusty dirt road up into the lush mountains, where the day becomes surreal. It's a steamy, damp sauna of a morning as we approach the first school, a structure you or I would take for a tool shed. 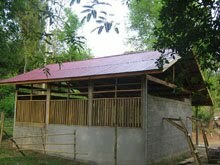 The long bamboo hut with dirt floors features walls alternating between corrugated metal and woven leaves. 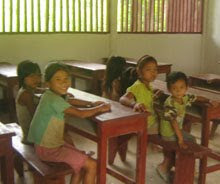 The structure is divided into four classrooms, one blackboard each; the students sit at wobbly planks as desks, three children per plank. Faded Communist posters on the wall depict something about toilet hygiene, pregnancy, and sexually transmitted disease. In the rainy season water pours through the thatched roof and the floor turns to mud. We pull up in a van and 150 children dash into formation – our arrival apparently anticipated and rehearsed. The rest of the village is there erecting bamboo structures for what I’m told will be a new year’s celebration later in the week. We exit the van to giggling and commotion in the hot dry dust and I sheepishly unload the boot. The staff, three village elders, greet us in dusty suits – the principal an ancient man missing his right arm from bomb schrapnel 40 years prior. He whistles as we approach and the children line up by age, dressed in simple blue shorts and skirts, smart white shirts, red scarves for ties – all dusty, many without shoes. We stand quietly as they break into song and slowly raise a tattered flag. I notice even Somnuek singing, eyes closed, sharing what must be a national anthem for our benefit. Somehow we’re guests of the highest honor, the eyes of the village on these tall white Americans. I’m asked to step forward and make a statement. Reluctantly I stammer out a few words about the beautiful Lao country and the even more beautiful Lao people – and how I can’t wait to share my experience with the people of America, and Colorado, where the snow is piled up to here – but words don’t serve me well at the moment. Somnuek translates to a response of giggles and cheers (is there even a Lao word for snow? ); he’s beaming, as am I. Soon the children step forward one by one and we hand each a book, a pen, a toothbrush, and to those without shoes a pair of cheap sandals – and every child from 4 years old to 10 looks me straight in the eye, bows with hand on forehead, and offers thanks; my eyes are tearing up by the third child in line. We snap photos all day, flipping the camera around after every shot to show the children their image – they roar with uncontrollable laughter, which completely cracks us up every time, which makes them giggle all the more. This scene repeats three times this morning of 21 December. Three remote village schools, including the one Somnuek attended 20 years previous. He takes us to the house he grew up in – a wooden shack at the base of a hill populated for countless generations by Lao rice farmers. People in this part of the world rarely see money – no electricity, no running water, little medical care, but by every visible measure are among the most peaceful and gracious people I’ve ever met, with incredible family and community ties. We have much to learn, I reflect, from such simplicity. 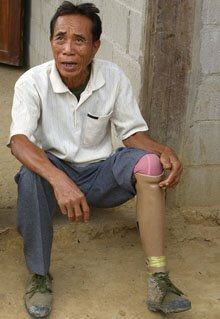 We give a blanket to his elderly neighbor, right leg lost to a bomb in 1968 – his 35 year old prosthetic patched together with metal plates and rusty screws. Each school has prepared a lunch of coconut milk and fruit; each group of children as excited as the last; every child thankful for the small gift; me a basket case by the end of the day for having been treated like royalty for a few hundred bucks stretched ridiculously thin. We ask about life at these schools - the teachers explain that the structures are in dire need of repair – roofs need patching, floors need concrete. There are not enough desks, chairs, or supplies. The outdoor squat toilets have no running water, causing serious health problems for the children. We look at each other, then have Somnuek ask – so what would it take for basic repairs to a school – to fix roofs and mend walls and build toilets with clean water? The teachers huddle, scribble some calculations, and respond – about 500 US dollars. Wow. In my head flash shameful images of some of the frivolous things I’ve done with $500 in my life. Electronic gadgets. That Kobe beef dinner at Nobu. A perspective-shifting moment, to be sure. I vow silently to do something. It seems the government does little to support these areas, and no foreigners have set foot in these villages in decades – so incredibly our tiny gift this day represents a substantial charitable act, and we’re the first white people 500 children have ever seen. On a day I awoke as a tourist asking what life was like in the heart of this country. My final request for the day is to return to a village for UXO victims we’d visited the year before. With no assistance from the government or the outside world, these survivors and their families gather to live together and support each other, surviving on what they can grow or cultivate on this small patch of land. 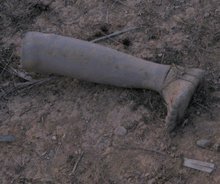 Old prosthetics - and I mean rusty metal cylinders - are shared amongst this group, children included. The only Lao hospital offering government aid is hundreds of miles away in the capital city of Vientiane, which for these families might as well be on the moon; it's an impossible journey. So they come together and take care of themselves, however they can. Considering the history of this place, I wondered how we'd be received as Americans in this village. I mean if ever a people had a right to be resentful, it's here, in this village, where their only contact with the western world rained down from the sky thirty years ago. But to my continued, humble amazement, they welcomed us warmly that first day, and walked us through their homes, and proudly showed off the one-room schoolhouse that they'd built themselves. Their warmth, their peace, with materially so little and so much to rightly be resentful for, moves me to the core. How do they do it? To smile peacefully, from crippled bodies, to welcome us as friends among their children - could I be so strong? My shift of perspective that day is immeasurable. We’d taken some wonderful photographs that first visit that I wanted to give as gifts to the locals this day, one year later. We arrive just before dusk and hand off the last of the school supplies to their tiny schoolhouse. I then share the photos with the village leader, unsure of his response to this gesture. After a good laugh he walks us through the village to the subject of each photo, where the responses range from puzzlement (they’d surely never seen a photograph of themselves before) to a sweet smile and laugh – the children go absolutely nuts on seeing their image in print. They join our procession proudly showing off their likeness to one and all. The photos are a hit; I quickly wish I’d printed many more. Soon half the village is in tow, kids giggling, Somnuek beaming. The very definition of irony: one of the children running around in a U.S. Army t-shirt. In this village created by bombs. After returning from Asia and continuing correspondence with Somnuek all spring, I decided to arrange for some help for the schools I’d visited in December. After sharing my stories with family and friends, several stepped forward with financial donations, and in May I had the opportunity to return to Laos during a business trip to China. During my short stay Somnuek and I returned to each of the three schoolhouses and discussed specifics with the staff. We drew up lists – corrugated steel for roof and wall patches, concrete and tile for toilets, plywood and paint for blackboards, desks for students and teachers. 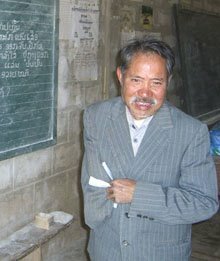 We then ventured out to buy all the supplies locally (at the Lao equivalent of Home Depot, a motley tool shed of random building materials), hired a local carpenter for the furniture, and arranged for transport of all materials to each school where the local villagers would provide additional labor. With a few dollars left we bought books and supplies for the children. Within a few weeks the work was completed; Somnuek providing photos every few days showing the progress. New toilets for two of the schools, tables and benches for a hundred kids, roofs and walls patched. The region’s Minister of Education has invited everyone who contributed for a personal thank-you when in town. Next, Somnuek and I are thinking bigger – his home village is in need of a schoolhouse of its own. 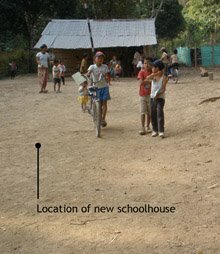 Currently their children walk or ride bicycles several miles to a neighboring village and its overcrowded school; a schoolhouse of its own would mean much to this community. What a wonderful opportunity, to create something for future generations - I can't think of a better way to give back. So we've done some calculations, and Somnuek's drawn up some plans, taking into account what he'll be able to do himself in the small metal shop he's built up in his home, and we figure we can build the entire school for about $7,000, including teacher's salaries for several years. He went to the regional government and told them our story, and has received permission to make it happen. So that leaves us raising some money in the next few months; I'm going to do what I can. I'm planning my next trip to Laos for later this year, hopefully to break ground during the dry season. I'll stay as long as I can to do as much physical labor as possible, and will leave the rest in Somnuek's capable hands. Friends and family have started to offer contributions for this venture, and for that I'm deeply grateful. Of course we'd welcome any small amount from anyone willing to share - I can't overstate the rewards. Keep in mind that we're not an official institution, just a few people wanting to share good fortune where it's really appreciated. What I can promise you in return is a gracious thank you from some of the kindest people on the planet, and pictures of how every penny is being spent. Send me an e-mail at bill@djbillstephens.com if you're interested, or even Somnuek at SomnuekBounsa@yahoo.com. And look up Somnuek next time you're in Luang Prabang. You just may never be the same.